That Time Paul Shaffer Went Swimming With Martin Luther King Jr.
You sometimes find poignant stories about major historical figures in unexpected places. On Martin Luther King Jr. Day, I'm reminded of a passage from Paul Shaffer's highly entertaining memoir, We'll Be Here For the Rest of Our Lives: A Swingin' Showbiz Saga. The next day Dad spotted Dr. Martin Luther King Jr. by the pool. The great leader was in matching shirt-and-bathing-suit cabana attire. My father approached him and said, "My family and I greatly admire you and would be honored if we could take your picture." "With pleasure," said Dr. King. Dad snapped the photo. We all shook hands and went to the lounge chairs. 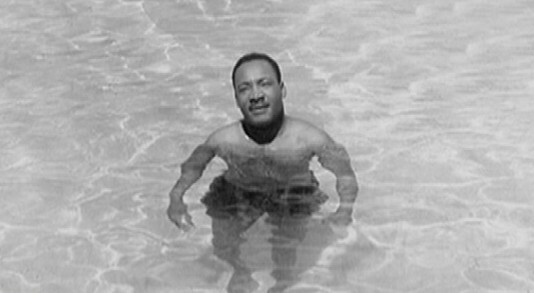 A few minutes later Dr. King entered the pool from the deep end while I entered from the shallow. Just like that, the dozen or so vacationers, white people all, who were in the pool suddenly got out, as if the water had been contaminated. Dr. King and I stayed in and swam for the next 20 minutes or so. When I got out, my father took me aside and said, "We're changing hotels. I'm not staying anywhere the guests display this kind of racist behavior." ... When I told this story to my son, Will, who was nine at the time and studying the civil rights movement in school, he was puzzled and said, "Dad, how could Dr. King stay at that hotel when there were segregation laws?" "Those laws were in the United States, son," I said. "That's why to vacation comfortably, he had to leave his own country." The IMDB plot summary for the 1955 advertising short called A Word to the Wives is succinct, and accurate: "The story of two women and how they trick a husband into renovating a kitchen." But it doesn't do this 13-minute mini-film justice. A Word to the Wives features one of the earlier acting jobs in the career of Darren McGavin (who plays the put-upon husband). It was directed by Norman Lloyd. And the star (and doing the voice-over narration) is Marsha Hunt, who was acting in movies and television from the 1930s into the 2000s. That's quite a bit of talent for what was a promotional movie sponsored by the American Gas Association, the National Association of Home Builders, and The Woman's Home Companion. The Internet Archive summary of the movie states that the "American Gas Association offered prints of this film for sale to gas utilities to help them coax builders to incorporate kitchens into their new homes." It's a comical short that shows two wives - one who just got a brand new house with an all-gas kitchen, the other who badly wants the same - hatch a plot to convince the new-kitchen-craver's husband to take care of his woman, too, with an all-gas kitchen. It's not a work of art or anything. But A Word to the Wives is an interesting historical document of the era, and in the careers of (in particular) McGavin and Lloyd.